DTH hammer bits and stone working tools. Limited Liability Company вЂњBINURвЂќ founded in 1994 is one of the leading Russian manufacture of TC tapered, drifting , DTH hammer bits and stone working tools. The main customer groups are: mining , quarries, stone-working companies of Russia. There are following well-known mining companies among of вЂњBINURвЂќ consumers: вЂњNorilsk NickelвЂќ; вЂњPechenga NickelвЂќ and вЂњApatityвЂќ in the Kola Peninsula; вЂњGaisky GOKвЂќ, вЂњSibaisky GOKвЂќ, вЂњVysokogorsky GOKвЂќ in Ural; вЂњMnogovershinnoeвЂќ, вЂњDalpolymetalвЂќ in Far East; вЂњALROSAвЂќ in Yakutia. As well вЂњBINURвЂќ sells the products to the customers based in CIS counries (such as Ukraine, Kazakhstan, Kyrgizia) and overseasin Europe, Asia and Africa. In production process we use only quality raw materials made in Russia or imported of well-known brands. All the raw materals well income tested in accordance with the strong norms and regulations. 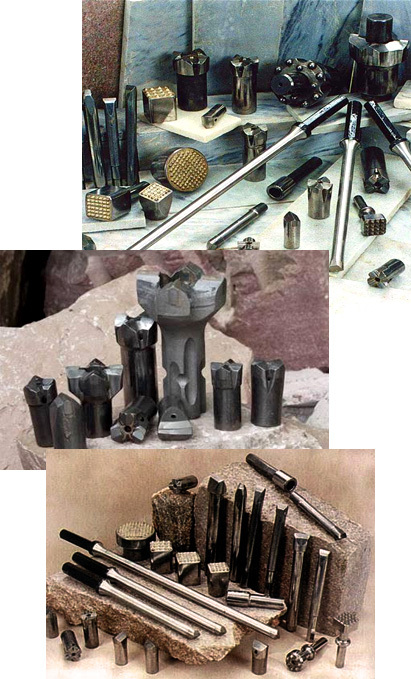 вЂњBINURвЂќ is very well experienced company in production and research of TC drill and stone working tools. There are modern research and manufacturing facilities available: steel processing machines, heat treatment equipment, research tools etc. Also High qualified and educated stuff is the strong point of the copmany . So far вЂњBINURвЂќ has been doing a lot of reseach activities.